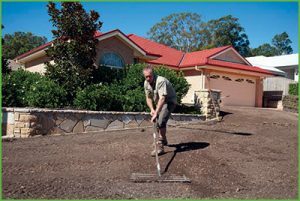 In Queensland we’re particularly lucky – our climate allows us to be able to install a new lawn any time we like. Regardless of the time of year the process of installing a new lawn is an important but fairly simple one. Remove any existing lawn and all weeds. ALL of them – trust us, it’s a lot easier to remove them now rather than have them come up through your new turf. You can remove them by hand or use a glyphosate weed killer to ensure you got every last one of them and their roots. Contact the team at Harden Park Lawns to organise the delivery of your new lawn. Build up the soil with an organic sandy mix or pure washed river soil. The normally recommended depth is 50mm but if you have a soil profile of heavy clay we recommend spread a generous amount of gypsum on first and then 100mm of sand. Level out the area – very important – this will ensure that your lawn is even. You can achieve this with a rake and a level. Apply a pre-planting fertiliser or launcher appropriate for the variety of turf you are about to install. Lay the turf as soon as it is deliver so that the root system isn’t allowed the time to dry out. Place the turf firstly along the edges and any hardscape features such as paths – this will make sure that there are no smaller pieces along the outside of the new lawn where they are more likely to curl and dry out. As you lay the turf press the ends and sides tightly against each other, leaving no gaps. Water the newly laid turf as soon as possible – ideally have someone follow along watering as the turf goes down. Watering will help the turf to settle, will trigger the fertiliser and aid the rolling process. You will need to water every day for at least the first week to ensure the lawn has the best possible chance to establish and thrive. Rolling the turf will firm the installation, squeeze out any air pockets and help to create a strong bond between the soil and the lawn. You will need a roller that weighs at least 45kgs for the best result. Push rollers or petrol powered rollers can be hired on a per day or per weekend basis.